This is a high-level overview demonstrating some the components of Dask-ML. Visit the main Dask-ML documentation, or explore some of the other machine-learning examples. This is most useful for training large models on medium-sized datasets. You may have a large model when searching over many hyper-parameters, or when using an ensemble method with many individual estimators. For too small datasets, training times will typically be small enough that cluster-wide parallelism isn’t helpful. For too large datasets (larger than a single machine’s memory), the scikit-learn estimators may not be able to cope (see below). 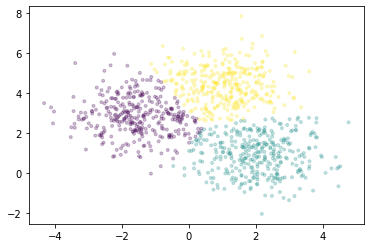 We’ll use scikit-learn to create a pair of small random arrays, one for the features X, and one for the target y.
We’ll fit a Support Vector Classifier, using grid search to find the best value of the \(C\) hyperparameter. To fit it using the cluster, we just need to use a context manager provided by joblib. We fit 48 different models, one for each hyper-parameter combination in param_grid, distributed across the cluster. At this point, we have a regular scikit-learn model, which can be used for prediction, scoring, etc. For more on training scikit-learn models with distributed joblib, see the dask-ml documentation. Most estimators in scikit-learn are designed to work on in-memory arrays. Training with larger datasets may require different algorithms. All of the algorithms implemented in Dask-ML work well on larger than memory datasets, which you might store in a dask array or dataframe.